Diane Nicholeris overcame early obstacles to build a life rich with music and teaching. So says Diane Nicholeris . . . and no wonder! 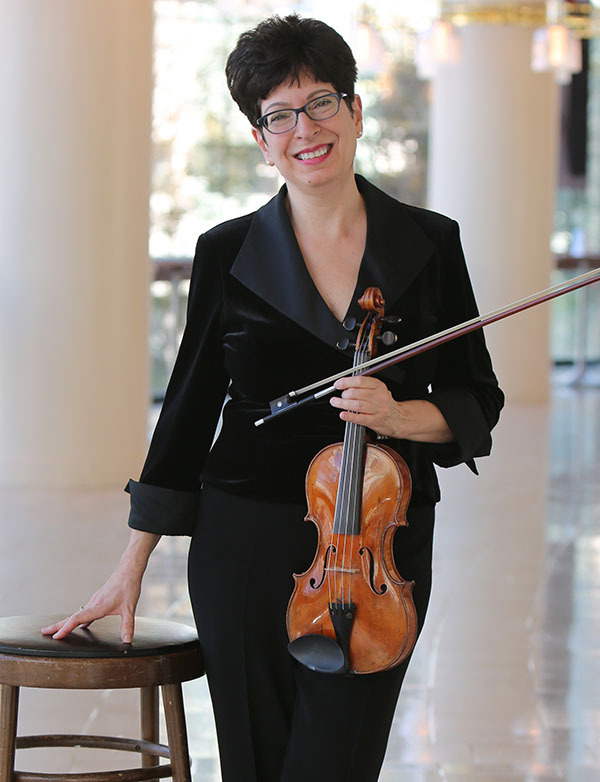 Her background is a rich tapestry of musical experiences, struggles, and perseverance, all of which she pours into her roles as a veteran San Francisco Symphony violinist and coach with the SFS Youth Orchestra. As a young student, Diane played violin in the Boston Youth Symphony. “That first experience learning the mainstays of the symphonic repertory is very important.” Later, she studied with two giants of violin pedagogy: Joseph Silverstein and Sylvia Rosenberg. But it was a painful accident that may have had the most influence on her life as a violinist. When Diane was eleven years old, having studied violin for less than two years, “I broke my wrist while riding an escalator. The doctors had no expectation that I’d have any wrist function afterwards. Eventually, I picked up the violin again, and little by little, I was able to get my fingers on the strings. It took me about six years to get seventy-percent use of the wrist back. Of course the accident hindered my progress, but I may have worked harder because of the many obstacles I had to overcome.